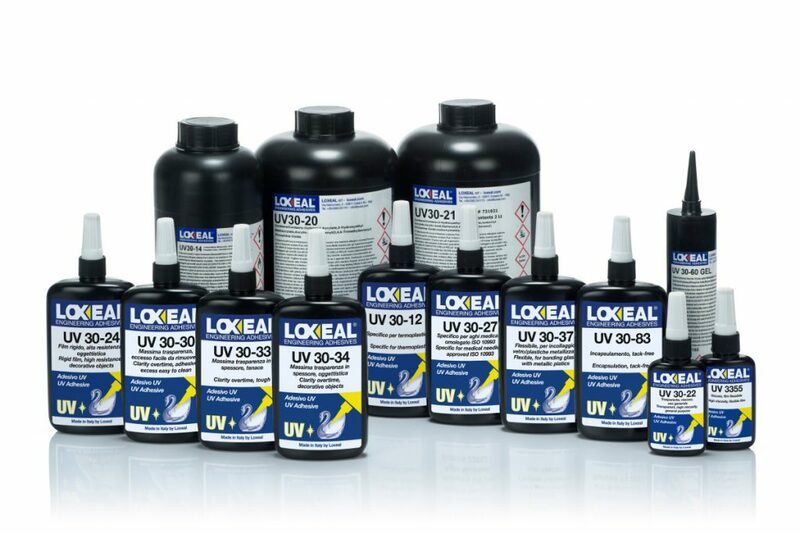 UV-Curable Adhesives | Loxeal S.r.l. Loxeal UV curing adhesives cure in a short time in presence of a UV light source, if at list one of the surfaces is transparent. They create a very tough plastic film. They are extremely reactive, they start curing as the sun UV light activates the photo initiators. Different kind of UV lamps are available for industrial use, such as mercury vapor lamps and led lamps. Fast curing, high strength Ultra Violet curing adhesive. Specially designed for glass and crystal bonding in manufacturing of decorative tableware, household, furnishing accessories, bonbonnières and gift articles. For its good optical clarity is ideal for bonding of precious crystals. Specially designed for bonding glass to glass, even edge to edge, or glass to metal bonding in glass and crystal furniture manufacturing. Suitable for safety glass and coloured glass (party UV radiation absorbing). Specially designed for glass to glass or glass to metal bonding. Very low viscosity, fast curing, high strength Ultra Violet curing adhesive. Specially designed for bonding float glass to glass in glass and crystal furniture manufacturing. Fast curing, high strength Ultra Violet adhesive. It provides a flexible and tough plastic film and it’s specially designed for glass to glass or glass to metal bonding. Medium low viscosity, fast curing, high strength Ultra Violet curing adhesive. Excellent optical clear over time, superior resistance to shock and vibrations. Specially designed for bonding float glass to glass in the manufacturing of glass and crystal furniture. Cleaning of joined parts from excess of adhesive after first UV exposure (5-10 seconds) is possible. Fast setting, high strength and transparent UV adhesive. Specifically designed for bonding glass to glass (floated, toughened, colored) and glass to metals. Suitable where edge joints in the manufacturing of glass and crystal furniture are required. Adhesive curing in seconds by exposure to ultraviolet light. Recommended for bonding glass to glass or glass with metal. Thanks to its exceptional transparency in thickness, it is recommended for bonding of precious crystals in the field of home furnishings and gifts. Recommended for bonding of glass to glass or glass to metal parts. Designed for a long lifetime in wet environments; it provides a balanced forces transduction. Ideal for bonding bathroom scales, door hinges for showers, aluminum and metal profiles on glass, traffic signs devices. It is ideal for bonding of precious crystals and glass tableware items due to its proved excellent optical clarity. Fast curing, elastic, shock resistant, Ultra Violet curing adhesive. Specially designed for glass to plastic and metallized plastics (ABS) or glass to metal bonding. It is ideal for bonding of decorative parts, bonbonnières and furnishing accessories thanks to its good optical clarity. Adhesive curing in seconds through exposure to ultraviolet light. High viscosity allows to fill large gaps, while maintaining an high transparency. Forms a flexible adhesive film resistant to thermal elongations, shocks and vibrations. Suitable for bonding of glass/glass and metal/glass assemblies where transparency is an important parameter. Fast curing, flexible, shock resistant, Ultra Violet curing adhesive. Specially designed for glass to plastic and metallized plastics (ABS) or glass to metal bonding as well as glass to glass application. For its good optical clarity is ideal for bonding of decorative parts, bonbonnières and furnishing accessories. Loxeal UV 3011 is a low viscosity adhesive fast curing under UV radiations or visible light with appropriate intensity. The adhesive has been formulated to bond PC, ABS, and PVC with low stress cracking. It makes a flexible and tough plastic film. Developed to assemble medical components. Approved for medical use according to ISO 10993 from Toxicon. Ultra Violet curing adhesive developed for use on thermoplastics and where appearance is important. It provides strong flexible bondings; fast curing is achieved with low-power lamps on PC, PET, PVC, ABS, PMMA. adhesion either to acrylics or to thermoplastics bonded to glass and metal. Ultraviolet curing adhesive specifically developed for bonding of PMMA.provides high mechanical strength; fast curing is achieved with led low-power lamps. It’s ideal for bonding of showcases, furniture, gifts and all PMMA structural applications. LOXEAL UV 30-27 series is fast curing, high strength Ultra Violet curing adhesive. The product is recommended for the assembly of medical syringe needles, also may be used for bonding some thermoplastics to glass and metal. The product is fluorescent to the blue light for the visual inspection. Medium viscosity UV curable adhesive developed for use as a doming and coating. Tack free in seconds. Suitableforencapsulating electronic components, designed for low power curing systems. It provides a protective colorless film after exposure at high temperature with no shrinkage behavior; its thermal resistance for short periods (thermal shock up to +270°C) allows to sustain wave soldering. It forms in place gasket and seals by irradiation with low-intensity UV lamps. It provides a flexible and soft film. Forms gaskets with high resistance to compression, fixes and seals pre-assembled components on their outside surface, encapsulates small parts. It is well suitable for creating seals and bonding of surfaces made of different materials and on surfaces with critical coefficients of thermal expansion too.